The Jellycat Truffles Sheep is back by popular demand. Very soft and cuddly, he will make great friends with everyone! 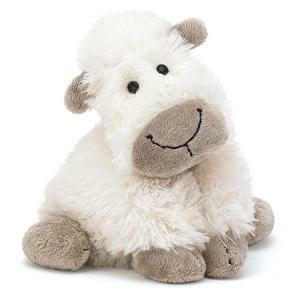 Truffles Sheep can stand, sit, and open flat to form a comfy pillow or soft friend. Highly recommended as bedtime buddies for children and adults alike. The large one opens up to a pillow large enough for two kids to share. The images to the left show the many ways you can use this cuddly sheep pillow buddy. So cute, so cozy, and so fun. You can also click here to check out our other cuddly pillow buddies and cuddle friends.